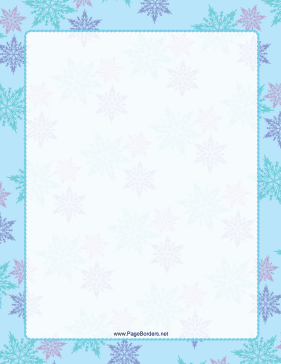 This Multicolor on Blue Snowflake Border includes blue, pink, and purple snowflakes. This page border is available in four free, ready-to-use file formats, or a $7 editable .AI version. The free versions are available in several different formats: as a Microsoft Word DOC, Acrobat PDF, as well as PNG and JPG image files. Download a border in your favorite format, open it in Word, a PDF viewer, or a graphics program, and print. The $7 version can be edited with Adobe Illustrator. It can be customized any way you like. You can pay using your PayPal account or credit card. You'll be able to download the customizable page border within moments. If you don't see a page border design or category that you want, please take a moment to let us know what you are looking for.